There's always a dish that is commonly made but everyone seems to have their own variation in making it. One example is meatloaf. Some use slices of bread, others use breadcrumbs. Some add in vegetables, others add cheese. Some top their meatloaf with ketchup, others top with a tomato sauce. Regardless of the variation, meatloaf is still regarded as a comfort food, especially during this time of year. 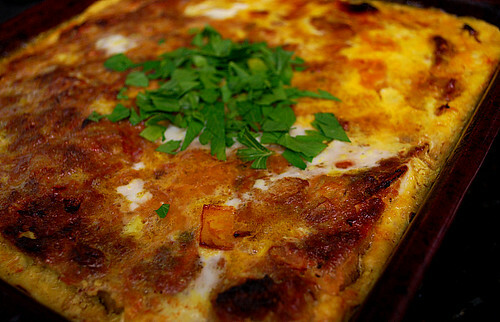 It surprised me to find South Africans have their own version of meatloaf too, also known as bobotie. This meatloaf is made in various ways based on everyone's preference. Originating from the Dutch, this dish was named after an Indonesian dish called bobotok. This meatloaf dish incorporates ground lamb or beef (or both) with spices such as curry, tumeric and chutney (influenced by India.) Mixed into the meatloaf are also raisins, nuts and hints of citrus from lemons. It may sound like an odd combination, but it just goes to show that this dish represents so much diversity for all the influences it has from other cultures. It's not particularly spicy but it does have a tremendous amount of flavor. As for texture, its complex as well because of the custard mixture that's baked on top, adding moisture to the dish. If you've wanted to try a more exotic meatloaf recipe, this is one I recommend. It may not please all tastes but it's definitely a way to experience South African cuisine in the comfort of your own home! Brown the onions and garlic lightly in the oil and add the curry powder. Cook gently for about two minutes. In a large mixing bowl, add the onion mixture plus all the remaining meatloaf ingredients. Mix well. Pack into an ovenproof dish that has been rubbed with butter. Bake at 350 degrees Fahrenheit for one hour. Beat the egg with the milk for the custard and pour over the top of the meatloaf. Bake a further 15 to 20 minutes until the custard is set and the top a golden brown. Top with chopped parsley for garnish. Serve with rice. Yield: 8 servings. I've used apricot jam instead of the chutney, either way, it's a wonderful recipe.